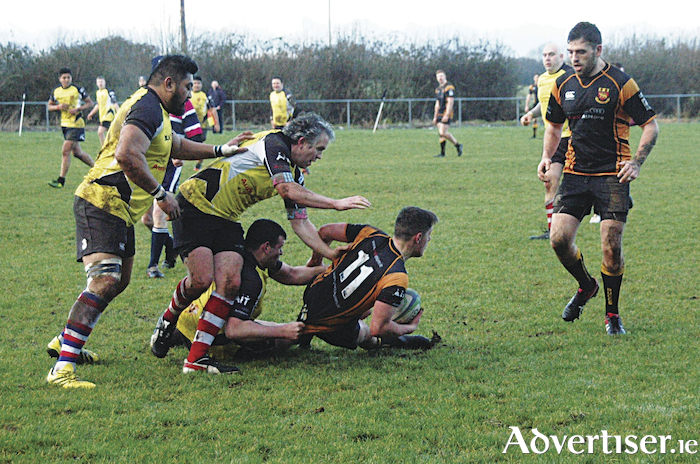 The Buccaneers President’s XV prevented the Exiles from making it three wins in a row when they came away 29-12 victors in the traditional St Stephen’s Day fixture at Dubarry Park, Athlone. Back-boned by a quartet of Byrnes, the president’s men took the game to the holders from the off. Played in cold but otherwise ideal conditions, the winners were the better outfit for the majority of what was a lively and open affair. Among the interested spectators were South African duo Dylan Rogers and Gavin Schoeman, who both played with Buccaneers. Rogers is now a Hong Kong international, while Schoeman is one of Buccs' most respected forwards. The challengers got off to a flying start, with winger Christian Joncker’s pace proving too hot for the Exiles as he raced in for a try which he also converted. The Exiles, however, were not about to relinquish their grip on the coveted trophy too easily, and following a burst by Niall Harney, skipper Kolo Kiripati surged through for a try, which he converted to level the scores. The Exiles regained the lead with an unconverted Robert Enraght-Moony try to hold a slender 12-7 advantage at half-time. They stretched their lead early in the second period when Enraght-Moony and Evan Galvin combined for the latter to score a try, which he also converted. The Exiles responded with James Tormey stretching over wide on the right for an unconverted try to reduce the Buccaneers President’s advantage to 19-12. But from thereon the winners proved dominant with Sean Byrne making a fine sally before his deft chip left Justin Meagher flailing and the big forward powered over for a try. The final score emanated from a typical charge by Keith Grehan that was finished off by Gerard Fallon for a try that completed the 29-12 scoreline. The Buccaneers President’s XV were the better balanced outfit against a more motley Exiles crew. Enraght-Moony deservedly won the man of the match accolade in a sporting contest that caused no difficulties for referee Richard English. After the match, the James Moran Exiles Perpetual Cup was presented in The Bounty by Mrs.
Kay Moran to winning captain Gerard Fallon. This was the 26th staging of the event for this Cup and was preceded by a first-ever Womens game, a fixture that will surely grow and add to the occasion in the coming years.